Welcome to the e-Book Cover Design Awards. This edition is for submissions during February, 2018. Dan Van Oss submitted Quantum State designed by Dan Van Oss. JF: Great stock art that’s both spooky and chilling, repurposed with solid type styling and lovely textural elements, all combining to draw us into the book. Ebook Launch submitted The Flash Diet: A Complete 14-Day Rapid Weight Loss Program designed by Ebook Launch. JF: This cover has the “Pow!” factor working for it, grabbing our attention and signaling its exact subject matter through clever yet simple graphics. A winner. A.R. Williams submitted The Untamed Sword designed by A.R. Williams. JF: That is one bizarre looking guy you have on your cover. JF: Well said, and it’s nicely done, although I’m not a big fan of very tight letterspacing like this because it does make the type just a bit harder to read. JF: Interesting but irrelevant to the outside observer, to whom this looks more like a sketch for a Tarot card. JF: Workable if a bit heavy. Not sure what purpose all the “crackling” on the title serves. JF: I like the old book look, but the picture in black and white doesn’t fit well, and it’s too small to see clearly. The title is also underwhelming. JF: Adding the top image made the background confusing, unnecessarily. Readers don’t know about the story yet, so having a clear message is much more important than trying to represent locations in the story. The author’s name looks like it was shoehorned into that corner. Ben Ellis submitted Broken Branches designed by Emery Greer. JF: Dramatic surrealism that works. JF: It’s a nice layout, but please go back and make the title stand out from the background, it’s disappearing. While you’re at it, use a different font for the subtitle, it’s so compressed it’s hard to read. JF: Strong typography and a dramatic image power this cover. Dan Van Oss submitted Operation: Zodiac designed by Dan Van Oss. Dan Van Oss submitted Accidental Archaeologist designed by Dan Van Oss. JF: Beautifully combines mystery and atmosphere, a winning combination. JF: Well, as they say, that’s why they make the big bucks. This is an effective combination of two scenes, with the bottom illustration locating us in a sweeping landscape, and the top giving us an insight into the story. JF: A strong cover, but note that the combined images here don’t balance as well as “Eden’s Bride” above. JF: Interesting use of color to separate the two figures. David Pennington submitted Gravity’s Loop designed by Kit Foster. DeAndre West submitted The Women In The Black Dress designed by DeAndre West. JF: This cover—designed by the author—fails to mention the author’s name, and while it’s a good concept it would need much better execution to reach its full potential. Deborah Coonts submitted Lucky in Love designed by Glendon of Streetlight Graphics. JF: Charming, but the balance seems off and I suspect it’s because the three elements are basically all the same weight/value. Dianne Frost submitted The Physics of Leaving (Lumen Cove #2) designed by Dianne Frost. Don DeBon submitted Heart Of The Machine designed by Don DeBon. JF: An obviously amateur production with a murky image and awkward typography. JF: An obviously amateur production with the “pasted together” look and awkward typography. JF: A terrific illustration that (unintentionally?) creates a link between the seaside scene and the word “Wave” in the title. Ebook Launch submitted Insanity designed by Ebook Launch. JF: The disturbing effect of this cover is heightened by the slightly out of focus type and the incomprehensible image. Ebook Launch submitted The Father of Flesh designed by Ebook Launch. JF: If you wanted your cover to represent a nightmare, this cover nails it. JF: She looks determined, and despite the fact that she dominates the cover, the author/designer has given us a hint to the setting and the presence of some magic, too. JF: Does the job, and while the illustration is basic, the title type strikes just the right note. JF: Both of these covers (see below) have interesting illustrations, but the “box within a box” look leads to a pretty static look. The treatment of the series title has a strong logo-type look. JF: A very expressive cover with great balance between the imagery and the typography. Jack Geurts submitted The Fire and the Forge designed by Jack Geurts. JF: Good idea, needs some help to make the image and the type “read” better. JF: It works pretty well although a different title treatment would have unified the cover better and would not have left that “blank” dark space floating above it. Jan O’Hara submitted Cold and Hottie designed by Jan O’Hara. JF: Cute, and its appeal is obvious. JF: Congratulations. It’s an exciting cover with clues to the story, a great focusing device in that ring of fire, and a stylish title treatment. Laura Duffy submitted The Tremble of Love designed by Laura Duffy. JF: A beautiful and sensitive treatment that might get lost in the postage-stamp sized covers we see online. JF: A strong photo background, but does it really say “romance”? JF: A little better, since there’s an association of gondolas with romance, but now the title is starting to disappear into the background. Mark Spano submitted Midland Club designed by Jeff. JF: Good concept and illustration, but the title needs work. JF: Artful and arresting. Is it a woman from the back, or an opening in that stone wall? JF: Style seems just right for a fairytale, but the title looks crammed between the roses and thorns. Miika Hannila submitted The 11th Percent designed by Dan Van Oss. JF: An expert job at creating atmosphere, combined with pro-level typography. JF: The font choice for the title is weak. JF: Visually, it looks like a book of poetry. JF: Interesting idea, but the execution is a bit of a mess. Rhiannon Gilmore submitted Prophecy Girl designed by Rhiannon Gilmore. JF: Indecipherable, can’t read the subtitle, and half the title looks like it was added at the end. JF: Looks good, but it would be even better if the title had more contrast with the background. Sarah Mendivel submitted Sam’s Theory designed by Sarah Mendivel. JF: The self-published look. No idea what the story is or why it might be of interest. JF: The “pasted-on” look, very weak typography, and principals so removed from us they are irrelevant. JF: Amateurish design approach that ignores the number one responsibility of any fiction cover: instantly signal its genre. JF: Any visual appeal is overridden by the inappropriate font, better suited to 3-word newspaper names. JF: It can be good to “zig” when everyone else is “zagging” but have you really given anyone a reason to pick up the book? VANESSA MENDOZZI submitted Evening’s land designed by VANESSA MENDOZZI. JF: Great illustration idea for this gothic thriller, although the line under “P.Z.” is bothersome, and the title type is so attenuated it risks getting lost against the background illustration. 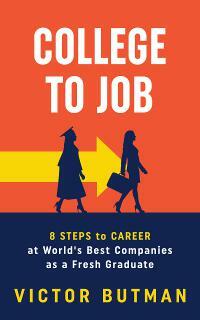 Ebook Launch submitted College To Job: 8 Steps To Career At World’s Best Companies As a Fresh Graduate designed by Ebook Launch. JF: Visually clear and effective with strong typography, but I can’t escape the feeling that the subtitle was written by someone only partially familiar with English. JF: I have no idea what TBAS is, but I think simplifying the background image would give the cover more impact. JF: Were you tempted to use a naked figure? It looks like the various elements were placed randomly. But hey, this book will sell itself anyway. Jean Gill submitted With Double Blade designed by Jean Gill. JF: Pretty cool, with interesting visual amusements, but I wish the title wasn’t the weakest part of the cover. Mara M. Zimmerman submitted How to Meditate and Why designed by Mara M. Zimmerman. JF: I understand wanting a minimalist cover for a book on meditation, but not one that’s so lacking in impact that it essentially disappears. JF: I guess you’d have to decide whether lying in a field is “creative,” but the cover works well, and you did a good job with the type. You might adjust the color of the yellow sneaker so it doesn’t bleed into the flowers, which is a bit distracting. Nicolas Windpassinger submitted Digitize or Die designed by Maxime Zoffoli. JF: A creative and effective print book cover that hasn’t survived reduction to this small size all that well. JF: Both the gratuitous “effects” on the title and the red flag peeking out are unnecessary distractions in an otherwise workable cover design that knows who its readers are. Rita Toews submitted The Tough Mamas Guide to Survival designed by Rita Toews. JF: Kind of brutal from a design point of view. Am I the only one who sees a pretty strange sexual message in the placement of those shoes?? Sheila Ferguson submitted Journey Back to Me designed by Lynne Holton. JF: Attractive, with a strong historical message from the period painting. The author name needs more contrast with the background, and although this approach is a bit generic (does it matter what kind of story it is? ), but the cover is well put together. Each month I look at these, always going one cover at a time, and forming my own conclusion before looking at your comments. In general, I’m not as concerned about covers as much as your are Joel, and I usually find a cover fine when you don’t. However, this month I found myself agreeing with you more. Gasp! As a self-published author with limited graphical and artistic skills, and no resources to hire out covers, I must make my own, learning on the fly. For that reason I suppose, I tend to be sympathetic to those writers who make their own covers that look amateurish. I have resolved never to choose or reject buying a book based on its cover, figuring even a bad cover might be the best the author can do under his/her circumstances. Also, the bottom line is – a book is all about its content. Since I follow some of “the numbers” I followed many books with great covers. People pull them when they are free by the tens of thousands but less than 0.1% review, and not even all of these reviews are good. Typically, a great book that satisfies its readers’ needs has a review rate of 1%-5%, depending on how well known the author is; that rate will increase once the book reaches reviews in the three digits, and can go up to 10%. Book reviews always tell the real story. For instance, take “50 shades.” Personally, I think that cover with the tie is really boring. Still, the book has 85+K reviews. (I’d love to hear Joel’s opinion of that cover. LOL). David, I sympathize with your predicament and that of other authors who are in a similar predicament. A great book can succeed even with a poor cover, and a great cover won’t carry a bad book very far. But since this site’s main purpose is author education, it’s our responsibility to try to put authors in the best position to succeed, and that requires both a solid book and a real plan on how the publisher plans to produce and market it. The greatest development for authors with ambitions that outstrip their budgets is the appearance of pre-designed covers, where you can get huge leverage from a modest investment. That’s one of the reasons we moved into this field this year, and I think if you look at the work available on our site—for under $100—you’ll see what I mean. Thank you! I learn so much from these! Happy to see Journey Back to Me receive a gold star. Sheila, it’s a cover that really works for your category. Good luck with the book! Congrats on the recent launch of your book cover service! Thanks Dane. The Flash Diet just leaped off the page, so kudos to you and your team. Gisela, thanks for continuing to submit your work.